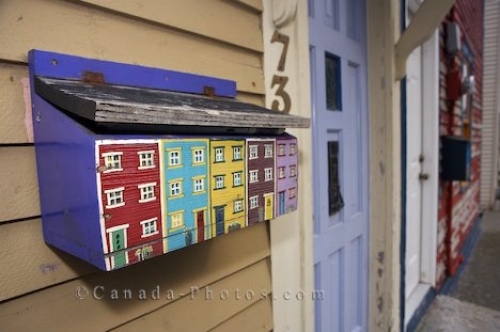 Some residents in the downtown area of St John's, Newfoundland decorate their mailboxes in the artwork that resembles jellybean row. Jellybean row is townhouses that are joined together and each one is painted in a different colour like the smaller version created on this mailbox. Quaint letter boxes of the charming houses in downtown St John's, St John's Harbour, St John's Bay, Avalon Peninsula, Newfoundland, Newfoundland Labrador, Canada. Picture of the artwork done on mailboxes in St. John's, Newfoundland Labrador in Canada which displays Jellybean Row.